If you have Outlook open all day while you’re working, it can be very distracting seeing desktop email notifications. 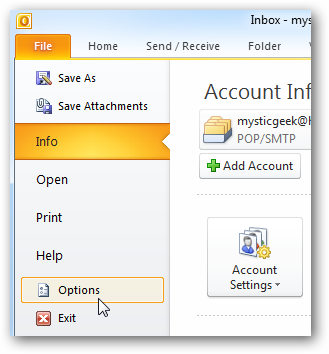 Here we show you how to turn the feature off in Outlook 2010. With Outlook open click on the File tab to access Backstage View and click on Options. Now in Outlook Options click on Mail then scroll down to Message arrival. 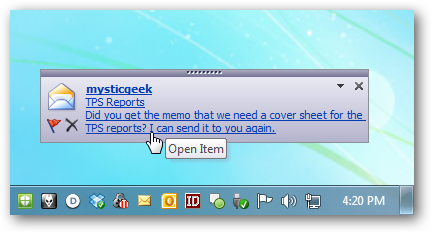 Then uncheck Display a Desktop Alert and click OK. If you don’t want a sound to play when an email arrives you can uncheck that as well. If you’re busy working on a project, having desktop email notifications popping up can be a huge distraction. Disabling them should help you get things done and improve productivity. If you’re an Outlook 2007 user check out our article on how to turn off desktop email notification in Outlook.